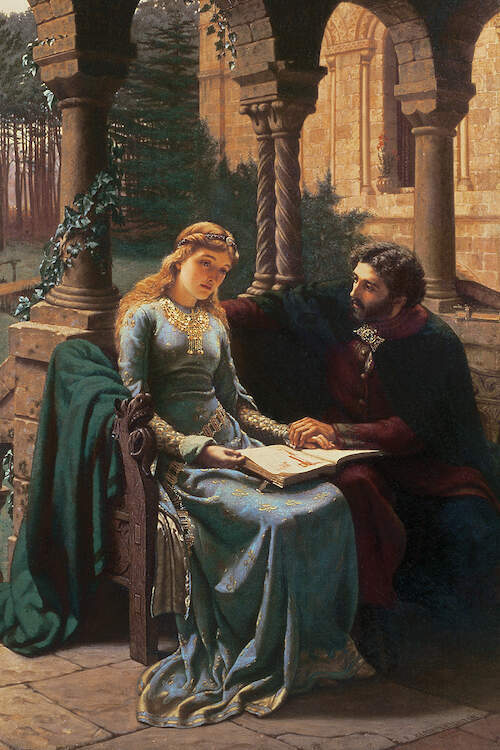 At the time this letter was written, Heloise and Abelard had been parted for over a decade. Never once had Abelard sent Heloise a letter recognizing the immense sacrifice she made for him or to check after her well-being. Heloise’s response below comes after a letter was passed to her from a third-party in which Abelard wrote of his fears for his life at the hands of his own pupils. After ten years of separation, Heloise worries after her lover of so long ago and writes poetically of her devotion to him and yet pain at his ignoring her. And so while Heloise and Abelard may have been the Romeo and Juliet of their time, so may Heloise have been the Shakespeare, as well. Below are bits and pieces of Heloise’s first letter to Abelard. Not long ago my beloved, by chance someone brought me the letter of consolation you had sent to a friend. I saw at once from the superscription that it was yours, and was all the more eager to read it since the writer is so dear to my heart. I hoped for renewal of strength, at least from the writer’s words which would picture for me the reality I have lost. But nearly every line of this letter was filled, I remember, with gall and wormwood, as it told the pitiful story of our entry into religion and the cross of unending suffering which you, my only love, continue to bear. …You revealed the persecution you suffered from your teachers, the supreme treachery of the mutilation of your person, and then described the abominable jealousy and violent attacks of your fellow students. …No one, I think, could read or hear it dry-eyed; my own sorrows are renewed in the detail in which you have told it, and redoubled because you say your perils are still increasing. …We beseech you to write as often as you think fit to us who are His handmaids and yours. …You have dealt us fresh wounds of grief as well as re-opening the old. I beg you, then, as you set about tending the wounds which others have dealt, heal the wounds you have yourself inflicted. …In the precarious early days of our conversion long ago I was not a little surprised and troubled by your forgetfulness, when neither reverence for God nor our mutual love nor the example of the holy Father made you think of trying to comfort me, wavering and exhausted as I was by prolonged grief, either by word when I was with you or by letter when we had parted. Yet you must know that you are bound to me by an obligation which is all the greater for the further close tie of the marriage sacrament uniting us, and are the deeper in my debt because of the love I have always borne you, as everyone knows a love which is beyond all bounds. You know, beloved, as the whole world knows, how much I have lost in you, how at one wretched stroke of fortune that supreme act of flagrant treachery robbed me of my very self in robbing me of you; and how my sorrow for my loss is nothing compared with what I feel for the manner in which I lost you. Surely the greater the cause for grief the greater the need for the help of consolation, and this no one can bring but you; you are the sole cause of my sorrow, and you alone can grant me the grace of consolation. You alone have the power to make me sad, to bring me happiness or comfort; you alone have so great a debt to repay me, particularly now when I have carried out all your orders so implicitly that when I was powerless to oppose you in anything, I found strength at your command to destroy myself. I did more, strange to say—my love rose to such heights of madness that it robbed itself of what it most desired beyond hope of recovery, when immediately at your bidding I changed my clothing along with my mind, in order to prove you the sole possessor of my body and my will alike. God knows I never sought anything in you except yourself; I wanted simply you, nothing of yours. I looked for no marriage-bond, no marriage portion, and it was not my own pleasures and wishes I sought to gratify, as you well know, but yours. The name of wife may seem more sacred or more binding, but sweeter for me will always be the word mistress, or if you will permit me, that of concubine or whore. I believed that the more I humbled myself on your account, the more gratitude I should win from you, and also the less damage I should do to the brightness of your reputation. …You kept silent about most of my arguments for preferring love to wedlock and freedom to chains. God is my witness that if Augustus, Emperor of the whole world, thought fit to honor me with marriage and conferred all on the earth to possess forever, it would be dearer and more honorable to me to be called not his Empress but your whore. 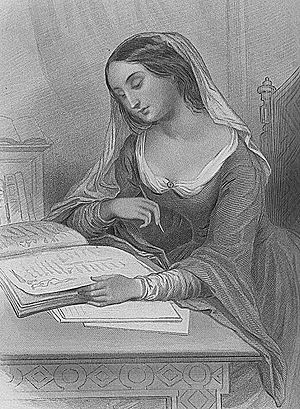 Source: Héloïse, and Peter Abelard. The Letters of Abelard and Heloise. Trans. Betty Radice. Harmondsworth: Penguin, 1974. Print. This entry was posted in Young Adult Fiction and tagged Abelard, Andrea Cefalo, Betty Radice, famous lovers, Héloïse d’Argenteuil, Heloise, medieval affiars, Medieval Lovers, Peter Abelard, Romeo and Juliet, The Fairytale Keeper, The Letters of Abelard and Heloise (Penguin Classics) on February 8, 2013 by Andrea Cefalo.